During the third and final night of their hometown benefit shows in Philadelphia last night, The War On Drugs brought out Tim Heidecker for a few songs. Heidecker’s comedy album Too Dumb for Suicide: Tim Heidecker’s Trump Songs was released last year, but the supergroup opted for an older cut from the comedian: a 2013 song titled “Hot Piss” from his band the Yellow River Boys. In addition bringing out Heidecker, The War On Drugs were also joined by Hop Along’s Frances Quinlan and Jelloman’s Paul Vile (Kurt Vile’s brother) to cover the song “Straight Into Darkness” from Tom Petty and the Heartbreakers’ 1982 album Long After Dark. The War On Drugs’ latest album A Deeper Understanding was released last year, earning them their first Grammy award and first No. 1 hit with the song “Pain.” The band paid tribute to Tom Petty last year, covering the song “Time to Move On” from his 1994 album Wildflowers. Back in October, Heidecker released a new song to benefit the Hebrew Immigrant Aid Society in the wake of the Pittsburgh Tree of Life synagogue shooting. His song “The Ballad of ICE Agent Ray” dropped back in June, following the release of his 2017 album of Trump songs. 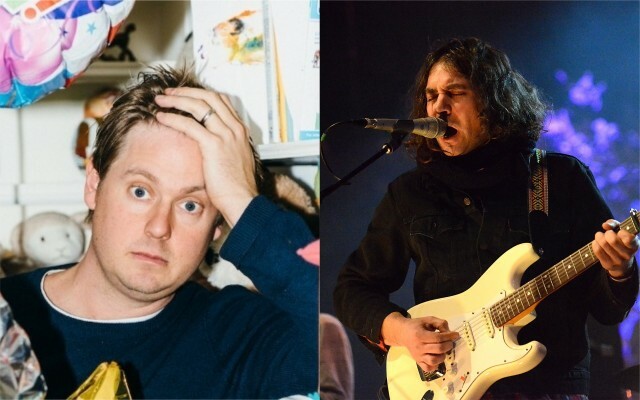 Watch clips of his performance with the War On Drugs below and revisit our published conversation between Heidecker and former Pavement frontman Stephen Malkmus here.